Successful SMEs with high fan-factor: DATRON AG again among "Germany's Customer Champions"
Mühltal, May 11, 2016 - The German Society for Quality (DGQ) and the market research institute forum! 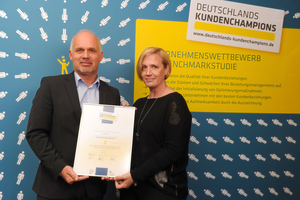 GmbH for the ninth time sought out "Germany's Customer Champions". 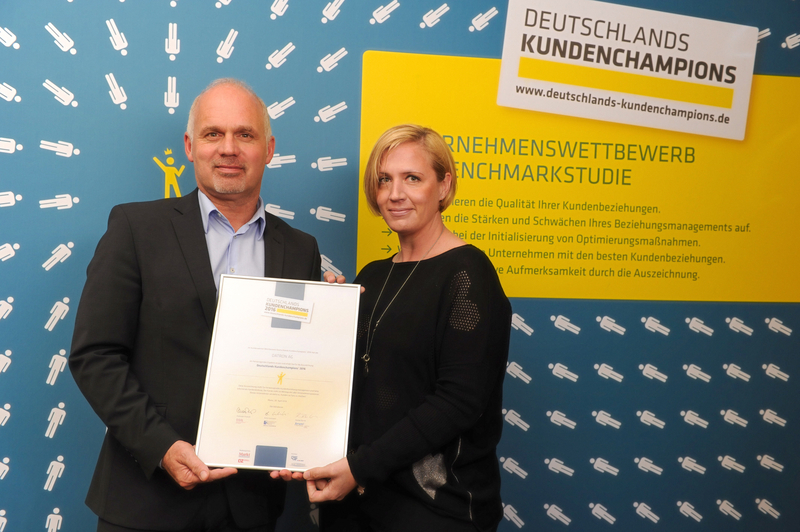 DATRON AG, an innovative engineering company from Mühltal-Traisa near Darmstadt, is one of the companies with a high "fan factor" and was rewarded with the award "Germany's Customer Champions 2016". 122 companies had competed in this benchmark study. After 2011, DATRON AG participated for the second time in the competition and was awarded for its customer-oriented corporate management as Germany’s Customer Champion. Examined by the forum! GmbH, the result of the competition is based on a detailed customer survey. Contacts were randomly selected from 1,000 DATRON customers by this independent research firm and an all-round customer relationship check was performed. As part of the survey, the following factors were analyzed: brand management and image, satisfaction in respective performance areas and employees of the company, emotional customer loyalty, complaint handling, statements regarding the product portfolio and the general range of services and rates. DATRON AG scored exceptionally high in regards to emotional loyalty and satisfaction of its customers and was recognized for its outstanding customer relationship management. DATRON CEO Dr. Arne Brüsch was pleased with the extremely positive results: "We are proud of this award. It confirms that the customer is our focus. Long-term trusting customer relationships and loyalty through customer focus and satisfaction are our key strategic priorities. The award "Germany's Customer Champions 2016" shows that our corporate strategy and our actions are appreciated by our customers and remain in their minds. 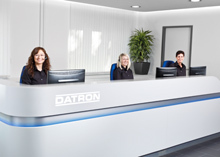 This spurs us as "Customer Champions" to continue and improve our products and services continuously and sustainably and increase the number of clients whom are DATRON fans and strengthen the emotional bond between us and our customers." Since 2008, the German Society for Quality e.V. (DGQ) and the forum! GmbH are searching for the companies with the best customer relations in Germany. The basis of the competition is a multistep evaluation process, in which the customer relationship of the participating companies are illuminated from different perspectives - a business and a customer perspective. Among a few things, the satisfaction with respect to individual service areas, the image and emotional customer loyalty are examined at the companies included in the study. The award recognizes companies that delight their customers and provide an excellent customer-oriented corporate governance, a prerequisite for long-term success of their customer relationships.